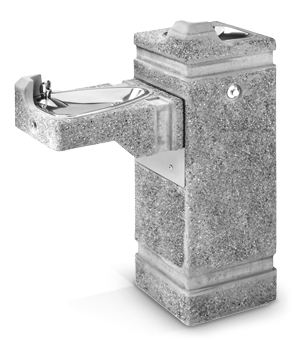 Dual height freeze resistant drinking fountain with a square, vibracast reinforced, concrete pedestal. Built for year-round use, prepared for temperatures below freezing. Includes hood extensions to protect the chrome-plated brass bubbler heads and a protected drinking point. Patented push-button activated stainless steel valve assembly. Easy front access to valve adjustment and cartridge replacement. Fountain shown on the right is Portland Gray with exposed aggregate finish and reinforced with 1/4" galvanized and 3/8" rebar. Now Requires the 3150FR, 3150FR-CC, 3150FR-CF or 3150FR-CCF and one of Valve Systems (Model 6518.2FR) Listed Below (Sold Separately) for a Complete Unit. Model 3150FR - Square Pedestal (Freeze Resistant) Drinking Fountain. Model 3150FR-CC - Custom Cement Color Square Pedestal (Freeze Resistant) Drinking Fountain. Model 3150FR-CF - Custom Finish Square Pedestal (Freeze Resistant) Drinking Fountain. Model 3150FR-CCF - Custom Color & Finish Square Pedestal (Freeze Resistant) Drinking Fountain.